This week I'm thinking about a summer BBQ favorite also know as my sisters mayonnaise nightmare aka #Potato Salad. As a kid my mom never kept mayonnaise in the house, leaving my sister and I totally clueless about potato or macaroni salad. It wasn't until going to a family friends bbq's one summer when I first laid eyes on this heaping bowl of lumpy piled high creamy potato hell. I knew I wasn't missing anything and for the life of me couldn't understand what everyone was raving about. The so called salad looked pretty pitiful, it kind of reminded me of what came spewing out of my sisters mouth after going to a birthday party where she had gorged herself on pizza, birthday cake and ice cream (sorry for all the nasty details TMI for sure). Until this day the sight of mayo sends my sister into a tailspin, clammy hands, cold sweats, you name it... it totally grosses her out. I've since gotten over my own nightmares of my first potato salad sighting and have learned to accept the eggy dressing here and there mostly on french fries or a club sandwich. 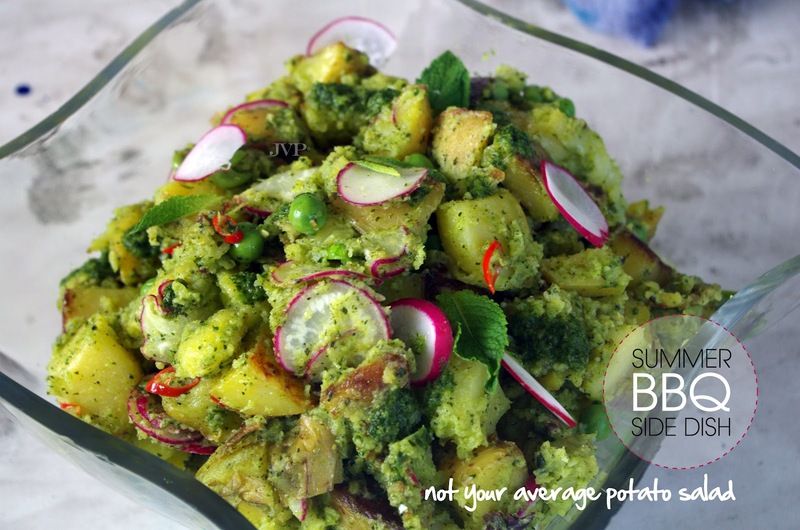 This refreshing take on the classic potato salad is for Courtney my amazing little sissy and it contains absolutely no mayonnaise. PREP: In a blender (or hand blender) pulse equal parts mint, parsley, cilantro, green onion with garlic, lemon, pinch of s &p & cumin. While blending drizzle olive oil until you get the perfect fluid texture. Par boil potatoes (about 10 mins) then chop. Thinly slice radish, chillies & thaw out peas if frozen. COOK: Toss potatoes in olive oil a pinch or s &p and roast (or fry) until slightly crispy and creamy inside. 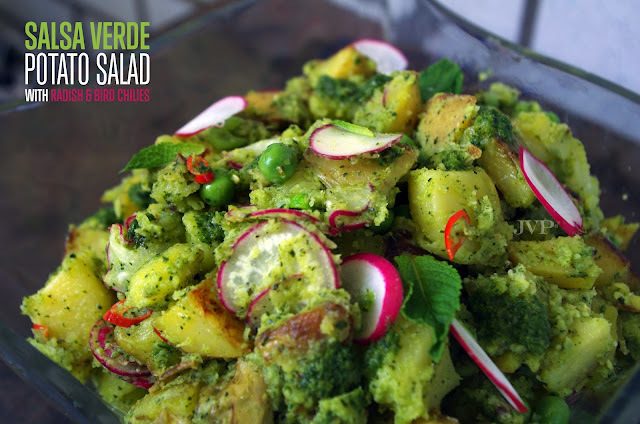 Toss hot potatoes & peas in the salsa verde with a big dollop of Greek yogurt, then add in radishes & red chilies. Adjust seasoning as needed. SERVE: Along side your favorite BBQ dinner. The salsa verde is delicious on anything... meat, fish, corn you name it! Cilantro, chili, mint, garlic and olive oil...now you're speaking my language!! Can't wait to try this potato salad. I bet it would be great as a dressing for wheat berries or farro salad too. Thanks for this wonderful recipe. What a beautiful potato salad. I love all the colors. Looks delicious! This sounds way better than your typical potato salad! I love all the fresh herbs and of course all the spice! Good job. I love the addition of radish! This looks so delicious! By the way, you may want to add the Google Friends Connect widget to the side of your page now that Foodbuzz is coming to an end. It's a great way to follow (through your reader list) and to be followed by others.